As the crowning achievement of its fiftieth season, Trinity Rep is presenting its production of the 1960 British musical hit “Oliver!”, based of course on the Charles Dickens novel. It ran three years in London, transferring to this country in 1963 where it was nominated for nine Tony Awards and won three of them. This version is under the direction of husband and wife team Richard and Sharon Jenkins (with Ms. Jenkins doing double duty as Choreographer). With book, music and lyrics by triple-threat Lionel Bart, and Music Direction here by Michael Rice (heading a five piece band), it’s a musical theater buff’s dream. (The 1968 film of the show, though it won the Best Film Oscar, was a disappointment for audiences familiar with its live counterpart). Dream or not, in the end, this is an “Oliver!” with a twist. The technical crew have created this twist, a far darker version of “Oliver!” than audiences are used to, but one that is eminently suitable for this show, based as it is on its equally dark Dickensian source. If the Set Design by Eugene Lee rings a bell, it’s because it’s essentially the same set utilized for the company’s recent “A Christmas Carol”, with a few minor tweaks, such as The Three Cripples Tavern sign and a curtain warning that only those who work will eat. (The original Broadway show is still remembered for its groundbreaking revolving set, often imitated since). The Costume Design by William Lane (notably for Fagin) and Lighting Design by Brian J. Lilienthal make great contributions to the look and feel of the production. The Sound Design by Peter Sasha Hurowitz could use some of that tweaking to balance the band with the singers. On the whole, it’s a success at recreating the grim Victorian era. But, as they say of restaurants with gorgeous design, you can’t eat the wallpaper. The proof is in the pudding; it’s first and foremost the actors that make or break a show. Fortunately, this company has a deep bench of true repertory actors, and a keen eye for casting. The huge cast is led by Phineas Peters, a Trinity stalwart, in the title role. 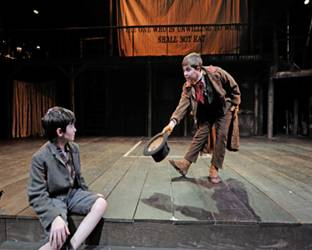 The pivotal role of The Artful Dodger is played by Noah Parets, whose recent work includes the title role in “Billy Elliot”; simply put, he’s marvelous, an assured and charismatic presence who moves extraordinarily well. The impressive cast fills the roles of Fagin (a fine Stephen Berenson), Nancy (the heartbreaking Rachel Warren), Bill Sikes (the menacing Timothy John Smith), Mr. Bumble (Tom Gleadow), Noah Claypole (William John Austin), Mrs. Sowerberry (Lauren Gemelli), also playing Bet, Mr. Sowerberry (Erick Pinnick), also playing Dr. Grimwig, Mrs. Corney (a hilarious Anne Scurria), also playing Mrs. Bedwin, Mr. Brownlow (Stephen Thorne), Charlotte (Whitney White), also playing Old Sally, and of course those ubiquitous children (doubling as workhouse orphans and Fagin’s band of followers): Alexander LeBlanc, Lily McMahon, Samia Nash, Tara Sullivan, Benjamin Thornton, and Emma and Eva Senerchia. There’s talent enough here for several “Annies” and “Newsies”. The fabulous score has a pocketful of standout numbers, including the title song, as well as the orphans’ lament ““Food, Glorious Food”, Oliver’s sweet “Where Is Love?”, the Artful Dodger’s bouncy “Consider Yourself”, Fagin’s instructional “You’ve Got to Pick a Pocket or Two”, the ragamuffins’ “I’d Do Anything”; there‘s also Fagin’s threatening “Be Back Soon”, Nancy‘s rousing double-entendre “Oom-Pah-Pah”, Fagin’s theft-affirming “I’m Reviewing the Situation”, the ironic anthem “It’s a Fine Life” (with the wonderful line “though diseased rats threaten to bring the plague in”), the plaintive “Who Will Buy?”, Sikes’ rant “My Name”, and Nancy’s tender “As Long as He Needs Me”. It’s no wonder the original Broadway version of the show won the Tony for Best Score. Monty (Montmorency) in "Neighbourhood Watch"
Having moved us to tears of sadness with their recent production of “Normal Heart”, Zeitgeist Stage Company now proceeds to move us to tears of joy as they present the New England premiere of the biting satire “Neighbourhood Watch” by Alan Ayckbourn, Britain’s answer to Neil Simon. As this is Ayckbourn’s seventy-fifth work (of seventy-eight, and still counting), perhaps it would be more accurate to refer to Simon as America’s Ayckbourn. In any case, it’s cause for rejoicing, even if it’s a deviation from the playwright’s norm. Instead of serial guffaws, this play elicits more gentle chortles, with a serious tone atypical for this author, a return to his darker farces. It seems the residents of Bluebell Hill Development have set up a Neighbourhood Watch Scheme in response to a minor misunderstanding that leads to near universal overreaction. Along the way, the playwright skewers his countrymen’s pretentious social climbers in the British caste system. The action takes place in the newly-acquired home of Martin Massey (Bob Musset) and his spinster sister Hilda (Shelley Brown). Martin (the owner of the above-mentioned gnome known as “Monty”, short for Montmorency, “bless his little head”), we quickly learn from Hilda’s eulogy, has been killed. In a flashback to the founding of the titular neighborhood watch four months prior, we see these neighbors progress from initial shared concern to outright paranoia, all the time keeping their upper lips appropriately stiffened. (As Hilda says so fittingly: “Tea first, then war”). By the time they’ve finally issued all their other neighbors their own OBDICs (Official Bluebell Development Identity Cards), things are clearly getting out of hand, especially with their (unseen) neighborly enforcers, the Wrigleys, gumming up things with their thug tactics. Escalation ensues, until Martin meets his demise while utilizing Jesus as a lethal weapon (and that’s not a typo). Musset and Brown are a delight as the increasingly crazed siblings, as are Victor Brandalise as Rod Trusser in full curmudgeon mode, Ann Marie Shea as Dorothy Doggett, the slightly batty local gossip, Ashley Risteen as the hilariously oversexed Amy Janner, Robert Bonotto as her husband Gareth with his sadistic plans for torture, the hulking (and hunky) Damon Singletary as the jealous Luther Bradley, and Lynn R. Guerra as his wife Magda. Guerra is especially marvelous in her increasingly manic complex character. As superbly directed by the company’s Artistic Director David J. Miller (who also created the Scenic Design), these talented actors present a wild and wacky romp. The technical crew contributions are all fine, from the varied Costume Design by Tyler Kinney, to the Lighting Design by Michael Clark Wonson, the Sound Design by David Reiffel and the crucial Dialect Coaching by Christopher S. Davis. At the close of the play, we may not have aching stomachs from serial laughter as with other Ayckbourn plays, but we’ve been treated to yet another roasting of British social climbers. And, truth to tell, a good deal of the satire could apply a lot closer to home. Happily, we’re at last presented, in the final scene, with the full Monty. Much ink has been spilled about Arthur Miller’s “Death of a Salesman” over the past sixty-five years since its premiere in 1949. Universally regarded as one of the finest American plays ever written, (and by many as the greatest play of the twentieth century), it has never ceased to move each successive generation of theatergoers. Thus it was entirely fitting that Lyric Stage Company chose to include this Pulitzer Prize winning play as it celebrates its fortieth season. The distinguished playwright himself described it, in a subtitle, as “certain private conversations in two acts and a requiem”, but surely couldn’t have anticipated how relevant and resonant those conversations would continue to be, despite some slightly dated melodramatic conventions. Miller’s profoundly and painfully touching portrayal of the disintegration of the titular salesman, sixty-year-old Willy Loman (here played by Ken Baltin, gradually shrinking before our eyes), the relationship between husbands and wives as well as between fathers and sons, the precariously fragile nature of humankind, and the obsession with external appearances as opposed to what’s going on inside, all are themes he expertly dissects. Far ahead of his time, he also dealt with the ravages of mental illness, the unnamed scourge of clinical depression. The heavy sample cases Willy carries are not the only baggage he and his family bear. His wife Linda (Paula Plum) and his two sons Biff, 34 (Kelby T. Akin) and Happy (Joseph Marrella) share in the failure Willy is experiencing, in small ways and large. Once the best of the best in the world of sales, he no longer makes enough to pay his insurance premiums. On a more universal scale, as the playwright once put it, he’s “ready to lay down his life to secure his sense of personal dignity; the underlying struggle is that of the individual attempting to regain his ‘rightful’ position in society”. There are no longer kings; the average man is, well, average. Though the play is set a half dozen decades ago, the tragic situation Willy and his family find themselves in could be the stuff of today’s headlines (even with such dated references as Filene’s Department Store). We feel the conflict in the most ordinary words: Willy describes Biff as “a lazy bum!”, only to hear him just moments later exclaim “There’s one thing about Biff-he’s not lazy”; he says he doesn’t like to see Linda mending stockings, which makes him “nervous” (or guilty), given that he has spent some of what little he has buying brand new stockings for someone else. At the close of the first act, Linda asks Willy about Biff: “What does he have against you?”. When we finally learn why Biff considers his father a “fake”, the devastating truth behind this particular family’s American dream is shattering. In the right hands, as it surely is in this current production, it’s easy to see why this is so widely considered the greatest American tragedy. As masterfully directed here by Producing Artistic Director Spiro Veloudos, every member of the cast comes across as perfectly natural. Akin, as the sports hero with his own weight of failure (“I’m no good, can’t you see what I am?”) and Marrella as the “other” son desperate for crumbs of attention (twice crying out about his weight loss and intention to get married), each get chances to shine. The rest of this fine cast includes Bernard (Victor L. Shopov), The Woman (Eve Passeltiner), Uncle Ben (Will McGarrahan), Howard Wagner (Omar Robinson), Jenny (Margarita Martinez), Stanley (Jaime Carrillo), Miss Forsythe (Jordan Clark) and Letta (Amanda Spinella). Larry Coen, as the neighbor Charley, is especially memorable in the final scene. But as terrific as this cast is, it is Plum who is outstanding (one is tempted to say in a plum role she was born to play) and heartbreaking in her final words: “We’re free”. All of the technical work is stellar, from the ingenious Scenic Design by Janie E. Howland (creating a multi-level playing area in a challengingly small playing area), very authentic-appearing Costume Design by Gail Astrid Buckley, crucial Lighting Design by Karen Perlow, and extremely effective Original Music by Dewey Dellay, setting just the right mood. In every aspect, this production is a winner. Miller’s work is about so much: love, pain, courage. So often, very profound things are expressed in seemingly simple words, such as the neighbor Charley’s description of Willy “riding on a smile and a shoeshine”, and the loss felt “when they start not smiling back…that’s an earthquake”, or in Biff’s summation: “The man never knew who he was”. As Linda puts it, while Willy isn’t the greatest character that ever lived, he’s still a human being, with a terrible thing happening to him. Thus, in the most iconic quotation in modern theater, “attention, attention must be finally paid to such a person.” As it must be to all of us, who, like Willy, have “got to dream, to make it happen; it comes with the territory”. The current production in Arts Emerson's season, “Red Eye to Havre de Grace”, is a complex creation, presented by the Philadelphia-based companies known as Lucidity Suitcase Intercontinental and Wilhelm Bros. & Co. An avant-garde musical, concert and/or ballet, it defies easy description or pigeon-holing. Neo-surrealist in tone, it has the multi-dimensional quality of cinema, the beauty and artistry of Poe’s poetry, and an other-worldly piano-based score that becomes as much a dark and funny mood piece as it is a work of theatre. This fulfills the aim of Arts Emerson, expressed by David Dower, Artistic Programs Director, namely presenting theater that is new, unlikely to be seen in our area other than when presented by Arts Emerson, and also international in nature (well, Philadelphia may not be that exotic). One fascinating aspect of this show is that Poe was born in Boston just a few blocks from Arts Emerson’s venue, the Paramount Theatre. The work begins with a humorous prologue by park ranger Steve (Jeremy Wilhelm), in charge of the Edgar Allen Poe House in Philadelphia. Poe (Ean Sheehy) lived there for six years during one of his most productive periods. Little is known about Poe’s mysterious last days: his boarding of a train in Richmond, Virginia, (the titular red eye to Havre de Grace, a city in Maryland) on September 27th, 1849 and his subsequent discovery on October 3rd, in a stranger’s clothes (straw hat, pajama top, and burlap pants), raving in a delirium. He died four days later in a hospital in Baltimore, having suffered a mental breakdown, possibly related to his addiction to both alcohol and laudanum. Often broke, confused and habitually drunk, Poe has always been the subject of curiosity about the demons that plagued him throughout his brief and heartbreakingly driven life. He was often obsessed with theories about metaphysics as well as the origin of the universe. He viewed poetry and other writing as art for arts sake, entertainment as opposed to moral preaching. As he matured, he became more and more desperate to keep himself and his beloved aunt/mother-in-law “Muddy” from poverty. He had married Virginia (Sophie Bortolussi) when she was just thirteen, and she died of tuberculosis. Among his many works, the lesser-known “Eureka” (about the “termination of the annihilation of the universe”) is referenced, as well as Poe‘s views from the sublime, about being an artist in America, to the most ridiculous (“Philosophy of Furniture”), often in the form of hallucinations, as in the ghostly appearance of Virginia. If this sounds too far out and off-putting, it’s not. What it is, is funny, with incredible visuals of his claustrophobic universe, dealing with his demons. Poe had the habit of stretching out on a lawn inhaling the smell of grass in order to calm his spirit when he was becoming overly agitated, and even that provides a stunning entrance for Virginia, one memorable cinematic moment. Designed and directed by Thadeus Phillips, created by him (with music by Jeremy and David Wilhelm of Wilhelm Bros. & Co. of Minneapolis) and performed by David Wilhelm, with Geoff Sobelle, Choreographer Sophie Bortolussi (who, as noted above, also plays Virginia), and creative consultant Teller (of Penn & Teller). The Lighting Design by Drew Billiau, Sound Design by Rob Kaplowitz, and Costume Design by Rosemarie McKelvey all contribute to the magical milieu, especially in the more creative second half of the production. It’s not often we have the chance to experience theater on such an original, phenomenally creative level. As Poe himself said in one of his works that is probably very familiar to most of us, “we loved with a love that was more than love”; this could easily be said of the audience reaction to such an inventive work. More tellingly, Poe also said that he was “never really insane except upon occasions when (his) heart was touched”. Most theatergoers will be crazy about this ambitious and, in the strictest sense of the term, fabulous piece of theatre. ART's "Witness Uganda": A Most Happy "Fela!" 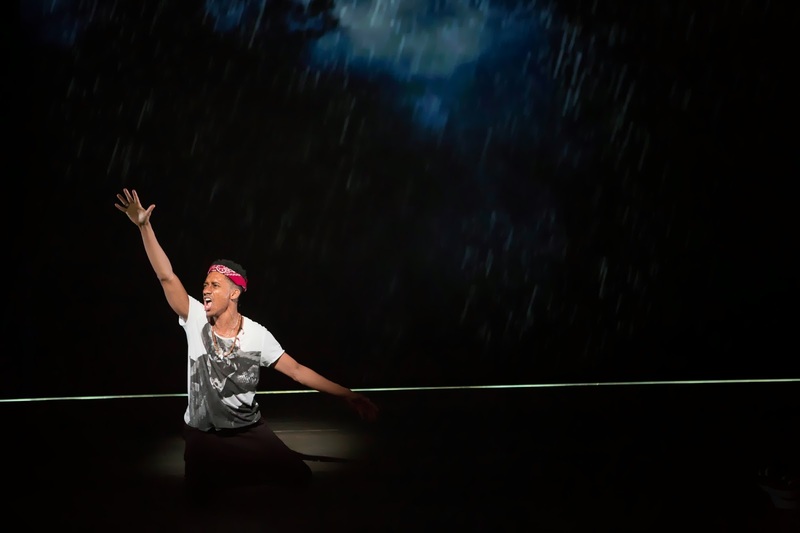 Griffin Matthews in "Witness Uganda"
Any resemblance between the hit Broadway musical “The Book of Mormon” and ART‘s current production of the new musical “Witness Uganda” is purely geographical. What this work does recall is the musical “Fela!”, the story of Nigerian singer Fela Kuti, in its ebullient, wondrous song and dance. "Witness", it should be understood, is not a noun but a verb, as in the action of witnessing a community. The winner of the 2012 prestigious Richard Rodgers Award for Musical Theater, it is the collaborative effort of two young artists, Matt Gould (who conducts and plays keyboard) and Griffin Matthews, who stars in this musical based on their personal experiences. They are the co-creators of the intensely vital book, music and lyrics, as well as the spirit behind their non-profit Uganda Project. Here presented in its world premiere and masterfully directed by Diane Paulus, it tells the story of an African-American actor, tired of pounding the pavement in New York, who volunteers to go to Uganda to help build a village school just outside the capital city of Kampala. He foresees it as the “trip of a lifetime”, and so it proves, but not in the way he expects. It is 2005, and the idealistic Griffin (Matthews), disillusioned by his encounter with the corruption of the missionary purportedly building the school, stops at the side of a road to speak with a group of teenagers who turn out to be destitute orphans devoid of hope. They long to be able to attend university, but face the reality that education in Uganda, at all levels, is not free. Sitting on a hill, described by them as their “school, which is failing (them)”, Griffin has an epiphany and decides to try to help them realize their dreams. The youngsters call him “muzungu” (meaning “a white person, at least in intent”). What he discovers is that changing the world is more difficult than he first anticipated. Gradually he comes to appreciate the real complexities encountered in the process of trying to help others. As Choreographer Darrell Grand Moultrie, with his own history of teaching dance in South Africa, has put it, “change is possible, but only if you are open to failure”. The real-life Matthews and Gould have condensed the story from eight years into two years, with fabulous music that blends unusual African rhythms with the more familiar rhythms of contemporary Western music. There are also the back stories about Matthews being rejected from his church choir in New York because he came out to them as gay, and the stark reality that homosexual activity is illegal in Uganda. As the protagonist of this play, he is extraordinary. There is also great work by the rest of the cast, in the roles of Jacob (Michael Luwoye), Joy (Adeola Role), Ryan (Emma Hunton), Eden (Nicolette Robinson), Grace (Kristolyn Lloyd), Ibrahim (Jamar Williams) and Ronny (Tyrone Davis, Jr.). The terrific ensemble includes Melody Betts, Rodrick Covington, Kevin Curtis, Latrisa Harper, Aisha Jackson, and Jamard Richardson. Matthews is a theatrical dynamo both as singer and storyteller, and Luwoye and Role are outstanding. Of this multi-talented group, all but one (Role) are making their ART debuts. In real life, Matthews and Gould understand that to create a musical, as Paulus puts it, “it takes a village”. Their creation is enhanced by Moultrie’s terrific choreography (inspired by Tribal dances from the Luweero District where the play takes place), as well as the marvelous Set Design by Tom Pye, Esosa’s colorful Costume Design, atmospheric Lighting Design by Maruti Evans, magically complex Sound Design by Jonathan Deans, moving Music Direction by Remy Kurs and, most especially, Projection Design by Peter Nigrini, (the creator of projection design for the aforementioned “Fela!“), the most astounding use of this underappreciated art for which there should be a Tony category (and which, if there’s any justice in this world, Nigrini will own). The seven piece band led by Gould is a fabulous onstage presence. At the center of this play, of course, are the contributions of Gould and Matthews, who learned the hard way where to focus their energy, as exemplified by the Ugandan axiom: “If you wish to have a banana, do not stand under an avocado tree.” They also learned to “stop teaching and start listening”, and that “God never tells you the whole story of your life, only what you can take.” Matthews compares his revelation to the elephants his students had never seen before he took them to a game preserve to see them: “It was here and I didn’t see it.” He came to change the world, and as is true with many before him, was changed by it; he’s taught by his students to endure, in order to get the gift lying in store for him. This work, a gift lying in store for fortunate theatregoers, revolves around the fundamental American impulse to help and the obstacles encountered. Matthews and Gould have chosen the musical form to convey this. As Matthews has said, singing is crying, and experiencing musical theater is like going to church, synagogue or mosque, in which you witness your community. Here there is a lot of singing, and a good deal of crying, but in the end there is mostly profound inspiration and exhilarating joy. Many who have witnessed this play have said “this is my story”. At the end of the work, the youngsters exclaim that they all “will rise”, and each of them is someone whom “the world should not miss”. The same should be said for “Witness Uganda”. When the musical “Company” opened on Broadway in 1970, it was heralded as a breakthrough landmark “concept” musical, and so it was. Nothing before (or since) has had the impact of this cynical view of modern marriage, in the form of vignettes rather than a typical book. 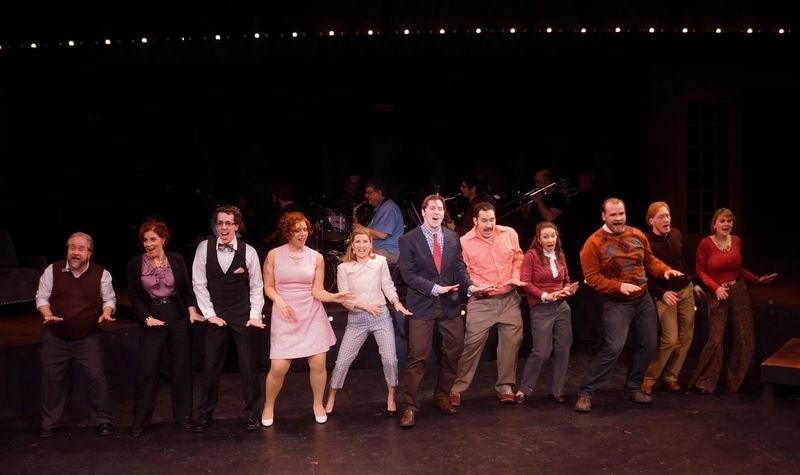 The vignettes by George Furth and the lyrics and music by Stephen Sondheim were revelations to audiences used to attending more traditional musical comedies. Nominated for a record fourteen Tony Awards, it won six (including Best Musical, Book, Music and Lyrics) among its many other awards. Moonbox Productions’ version is yet another golden opportunity for theatergoers to relish this unique work. As most Sondheim lovers will already know, it centers around the very eligible but not quite available bachelor Bobby (David Carney) as his circle of closest friends, five very different couples, are about to celebrate his 35th birthday. They consist of the world-weary Joanne (Leigh Barrett) and Larry (Rick Sherburne), the marriage-approaching--avoiding Amy (Shonna Cirone) and Paul (Peter Mill), the perpetually dieting and recovering, karate-kicking Sarah (Anne Colpitts) and Harry (Matthew Zahnzinger), the pot-smoking squares Jenny (Teresa Winner Blume) and David (Daniel Forest Sullivan), and the loving but amicably divorced Susan (Catherine Lee Christie) and possibly closeted Peter (Brian Bakofen). The play also features Robert’s current trio of girlfriends, Marta (Megan Alicia), Kathy (Lisa Dempsey), and April (Katie Clark), none of whom manages to hold his undivided attention. Robert is unwilling and unable to commit to a serious relationship, never mind marriage. His girlfriends are unaware of one another’s existence, and the various couples he’s befriended don’t know one another either. Robert juggles a multitude of relationships, standing back to critique each of them in a different way. Most of this is presented in terrific songs, many of them real zingers, with witty lyrics worthy of Porter, Coward, or…well, Sondheim. They include serious songs such as “The Little Things You Do Together” (“children you destroy together”), “Sorry/Grateful” (“you‘ll always be what you always were, which has nothing to do with, all to do with her“), “Another Hundred People”, and the title song; there are also hilarious numbers such as “Getting Married Today”, “You Could Drive a Person Crazy”, and “Barcelona”. And then there’s the quintessential Sondheim of “The Ladies Who Lunch”. And the finale by Robert, “Being Alive” (which replaced two other dropped songs, “A Multitude of Amys” and “Happily Ever After”), in which he’s urged to love somebody, but not some body. The performances are all wonderful, starting with the central character of Robert/Robby/Bobby-Bubby. Carney’s interpretation is the most human and touching in a considerable number of productions seen over the past several decades, here much more involved than he is too often portrayed, and at the epicenter of all the angst, while still an onlooker, still an outsider. As Joanne observes, the story of his life is that he “always meant to” get married. Barrett, despite the memories of beloved past divas in the role, makes Joanne her own, notably of course in her tribute to those lunching ladies “planning a brunch on their own behalf”. She remains in character even when not at the center of things, an acting lesson in itself. Cirone, in the zany, impossibly complex phobia-ridden rant (“let us pray…that I’m not getting married”) also shines. Even the less showy roles, such as Sherburne’s Larry and Zahnzinger’s Harry, are more developed under the insightful, detailed guidance by Director Allison Olivia Choat, who has things very much in hand. Moonbox’s technical crew has never been better, or more on evidence, than in the Roberts Theatre in the Calderwood complex, a much larger venue than the company has utilized in the past. Musical Director Dan Rodriguez (leading a nine piece orchestra upstage center) makes the most of the performance space. So does the Choreography by Rachel Bertone (in several numbers by the full cast, but especially in the terrific dance solo by Dempsey),which is amazingly creative and strikingly original. 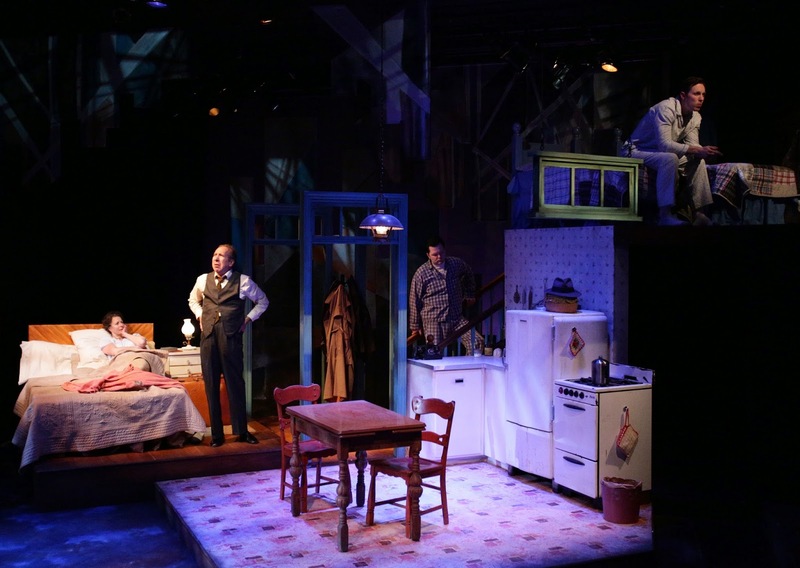 The Scenic Design by Dale Conklin, on six levels, is effective in both its simplicity and versatility for a show with so many scenes. The Lighting Design by Jeffrey E. Salzberg, Costume Design by Susanne Miller and Sound Design by Don Costello (although with some mike glitches, easily fixable), are all great examples of their respective crafts. The dialogue by Firth and the lyrics by Sondheim never cease to amaze; the stories told in this work continue to fascinate with each exposure to the material. We watch Bobby watching life’s “company”, via his friendships, love affairs, and eventual longing for marriage. As the lyrics to the title song announce, what this is really about is love, isn‘t it? “Life is company, love is company”. Especially as exemplified by this talented company, loving is truly “being alive”. This is a wonderful show in a ceaselessly entertaining production. Happily ever after or not, over the space of some two and a half enthralling hours, Moonbox is moonstruck, and so are we, not sorry but surely grateful. Mia Ellis as Esther in "Intimate Apparel"
Trinity Rep’s current production of “Intimate Apparel” by Brown University alumna Lynn Nottage (winner of the Pulitzer Prize and many other awards for “Ruined”), is, as the playwright herself describes it, a “meditation on loneliness”, inspired by her own family history. It was first produced in 2003, and made its New York debut in 2004, winning the Drama Critics Circle Award as Outstanding Play. As directed here by Janice Duclos, long-time Trinity Rep resident acting company member, it’s easy to see why it was recognized. It’s an unusual window onto the life of a talented but frustrated woman. The play takes place in 1905 in New York City, where Esther (Mia Ellis) produces, by hand, the boned corsets popular from the 1800’s to the 1920’s (despite several health problems women suffered from wearing them). Ironically, the constraints that society imposed upon women, and African Americans especially, mirror the limitations, discomfort and even pain endured by Esther’s clients in the pursuit of beauty. Her clients, here represented by two extremes, the upper class wealthy Mrs. Van Buren (Angela Brazil) and the disdained prostitute Mayme (Shelley Fort), have a lot in common, especially in the way they are treated or ignored by the men in their lives. The one decent man in Esther’s early life, the hard-working merchant Mr. Marks (Mauro Hantman), sells her the material she needs. Because of his devout Jewish faith, however, he cannot fulfill her more significant needs because of his own religious strictures. Esther’s landlady Mrs. Dickson (Barbara Meek) is a well-meaning presence, but perpetually trying to set her up with inappropriate suitors. Thus it should come as no surprise that a chance to pursue a promising long distance relationship (by correspondence) with a man from Barbados, George (Joe Wilson, Jr.), working on the building of the Panama Canal, provides a sudden glimmer of hope in Esther’s lonely life. This small cast of six manages to create many moving and memorable moments. Brazil is hilarious in her desperate drive to be au courant, as is Fort in her world-weary acceptance of compromises. Hantman is heartbreakingly conflicted in a sympathetic role at the center of Esther’s circumscribed world, almost but not quite providing the warmth she seeks. Meek is also devastatingly funny in her honest but fumbling ways. Wilson is very effective as the mysterious suitor whose intentions may or may not be as honorable as Esther wants to believe. And Ellis, while perhaps a bit too young and comely for the role of a plain thirty-five year old spinster, is a smoldering dynamo beneath her initial reticence. While the cast is uniformly terrific, it is Ellis who, both dramatically and literally, towers over the other players in Esther’s complicated story. Duclos’ direction of the various spheres of her life is impeccable. The one problem with this work is that those spheres don’t interweave into a coherent fabric. With the obvious exception of Esther herself, these characters all exist independently of one another, rather than in a truly theatrically satisfying arc. The scenes, for the most part, are presented as separate vignettes that, at least in the first act, are too heavy on exposition, creating the dramatic equivalent of Esther’s multi-colored quilt. The result of Nottage’s writing is a series of fine patches rather than a unified creation. Still, in the hands of a very competent director and a tremendously talented cast, it’s ultimately an engrossing piece of theater, even if, unlike the quilt, the sum isn’t the equal of its parts. In the wrong hands, this play might betray some of its weaker seams, but Duclos and her actors triumph and convince. The technical credits are all superb as well, especially the Set Design by Patrick Lynch, providing four distinct venues that, along with the Lighting Design by John Ambrosone, enable the many transitions from scene to scene to flow as seamlessly as Esther’s creations (without the need for blackouts). The Costume Design by Alison Walker Carrier is integral to the story and its period, as is the Sound Design by Peter Sasha Hurowitz, with effective ragtime musical interludes, as well as the Speech and Voice Direction by Thom Jones (most notably with the difficult Bajan lilt and Yiddish inflections). 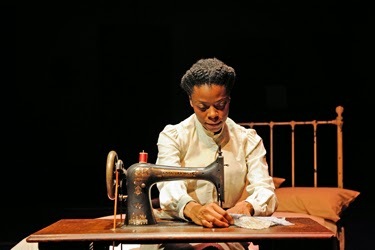 As all the real-life Esthers proved in their work and their lives, and this play portrays, it’s not what we see that involves us, but what makes us feel. As Mrs. Dickson says at one point, “we all bleed.” In corsets and in life, as well as on the stage, it’s what’s underneath that counts.